Cozy sweaters are a fall staple around my house. 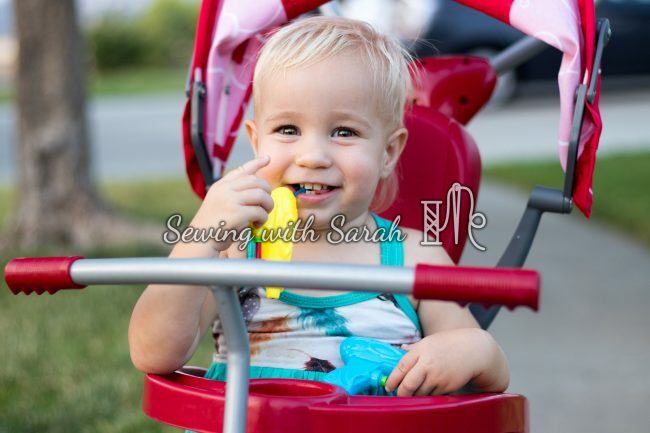 I love pairing them with jeans and boots for a walk around the neighborhood to admire the changing colors of the season, or with leggings and slippers curled up by a warm fire with a cup of hot cocoa. Since I’m on a mission to replace most of my ready-to-wear clothing with handmade, I decided I’d better get to work sewing them up! I decided on the Jalie Dolman pattern, which really deserves more love! 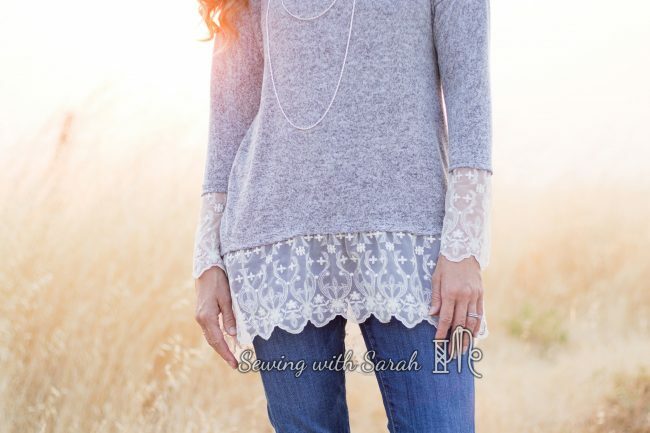 The scoop neckline, slouchy but not too oversized silhouette, and subtle hi-low hem are some of my favorite details, and I know I usually like the fit of Jalie patterns. I traced my usual size P, blending to a Q in the hips, and selected a sumptuously soft hacci sweater knit from Surge Fabric Shop (read to the end for an exclusive coupon code!!) I also decided to add some embroidered lace trim, also from Surge, inspired by their Pinterest board here. If you’re new to sewing with hacci sweater knit (I didn’t know what it was until late last winter! ), it’s a great sweater knit to get started with, as it doesn’t “grow” as much as some other loosely woven knits I’ve sewn with, and has excellent stretch and recovery. I always use maxi-lock stretch in my looper, along with a ball point/stretch needle if I’m using my sewing machine. I find that my machine likes to “eat” the fabric if I start too close to the edge, so I like to start a few inches away and then flip it over and sew back toward the end after I’ve reached the other side of a seam. 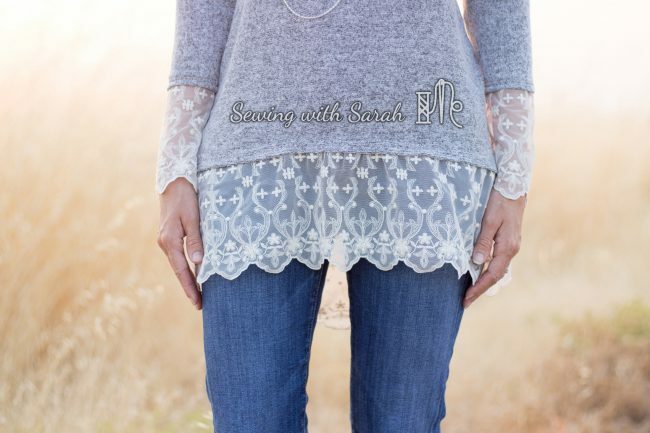 This sweater knit will unravel a bit if you don’t finish the edges, so make sure to use a serger or a zig zag stitch to prevent your project from unraveling. 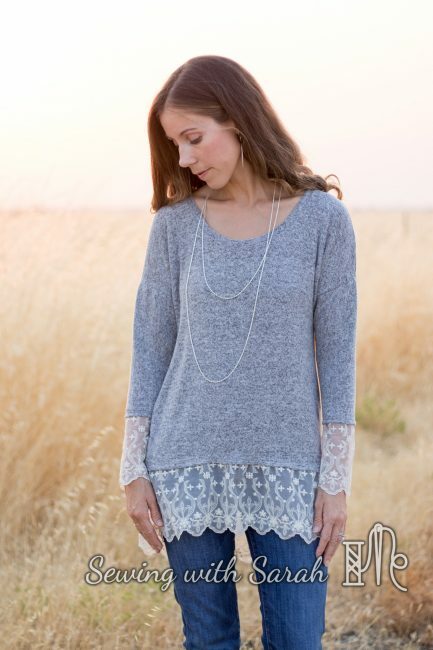 This article from It’s Always Autumn has some other great hints on sewing with sweater knits if you want to check it out! The hacci from Surge has a “shiny” side and a more matte side- I chose the matte side as my right side, as a contrast to the fancy lace. 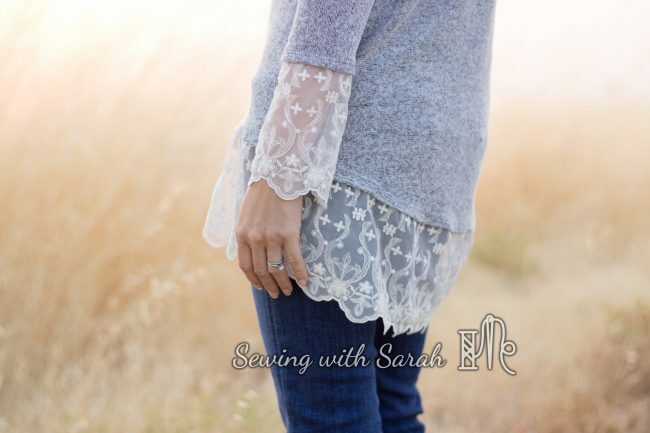 I sewed the sweater up as usual, hemming the sleeves and bottom, and then stitched the lace on underneath that, so it looked almost as if it was an under layer peeking out. After sewing the side seams, I did take the sleeves in a bit, for a more fitted silhouette there. I find that loose tops look good on me as long as there is some part that is fitted- in this case the arms. I also lowered the neckline slightly for easy nursing access- about 1.5″, ] and used the band option in the pattern for better recovery- I prefer to keep my lower body covered (and warm!) in the cooler weather so this will be perfect for us! I’m really in love with how this turned out, and while it was over 100 degrees when we shot these photos (the things I do for this blog! ), I can’t wait for the weather to cool down a bit so I can put this sweater into frequent rotation! 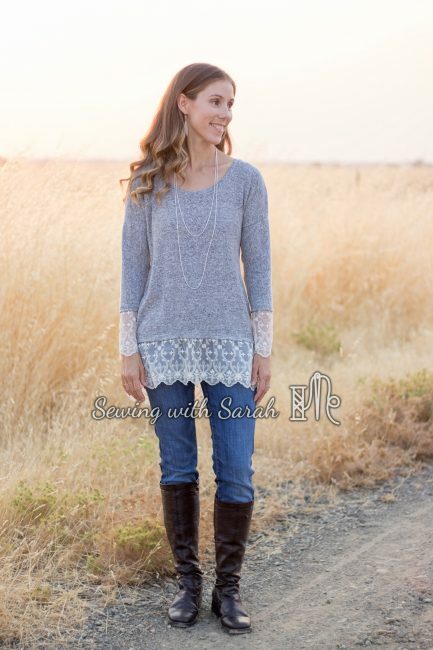 Want to try your own sweater knit/lace project? 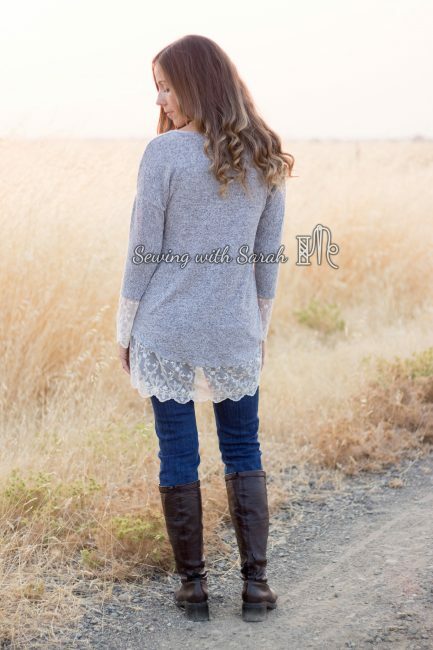 You can get 10% off the sweater knit and embroidered lace at Surge with the code “SWS10” through 8/25/17! They have it in every color- I’m drooling over the aqua and fuschias! Note: The fabric and trim in this post were given to me in exchange for my honest review. I bought the pattern myself, and all opinions are my own! There are also some affiliate links in this post, which means that if you decide to purchase a product using the links, a small portion of your purchase- at no cost to you- will be sent to me to help keep my blog running. Thank you! Here’s what this little princess was up to during our photoshoot- stealing the water guns and trying to shoot her brothers! She’s wearing her baby Sommer Dress, blogged here. Don’t forget to “Like” my Facebook Page and follow me on Instagram to stay connected!